I wrote a blog post a while ago with easy ways to support your favorite writers. Since then, two huge things have happened in my life: I read THE ART OF ASKING by Amanda Palmer, and I took a trip to the beautiful city of New Orleans. Since Ksenia Anske raved about THE ART OF ASKING, I knew I had to read it. In the book, Amanda Palmer talks about how her fans have supported her over the years. Because they believe in her art, they have no problem giving her money. Ksenia Anske is the same way – she puts art into the world for people to access for free. All of her novels are available to read on Wattpad or download from her website at no cost to you. If you can afford to fund her art, you should go for it – but she doesn’t demand money from anyone in exchange for her books. She’s happy that her stories go out in the world, and that’s enough to keep her going. While in New Orleans, I saw the most amazing street performers I’ve ever seen. Most of them looked like regular people, but they all had an extraordinary gift for producing art and music. I can’t tell you how many times I stopped to listen to a jazz band playing on the corner, or to watch an old woman throwing paint onto a canvas. It was incredible. I believe in the power of art to change people’s lives. I believe this because it’s happened to me, and I’ve seen it happen to people from all walks of life and of all shapes and sizes. Art transcends morality and physicality and all other limits on this earth – it simply is, and it gives without asking anything in return. Ksenia Anske and Amanda Palmer embody this idea of art, as do the talented performers in the city of New Orleans. There were several times I walked by this one woman playing a violin. Each time, I was so moved that I dropped money in her hat. She never asked for my money. She never asked for anything. She simply gave, and I wanted to give back. I wanted to do my part to help her make more art. That’s what I believe in. Here’s what I hope you take away from this post: art is vital to human existence, and in order for artists to continue to move us, they need our support. The next time you’re affected by a piece of writing or music or visual work, drop a dollar in the tip jar. Keep the art flowing – even if nobody asks. Most indie authors even have a donate button or virtual tip jar on their website for this very purpose. Next time you see one, throw in some money. You might change someone’s life. It could even be your own. How do you feel about street performers? 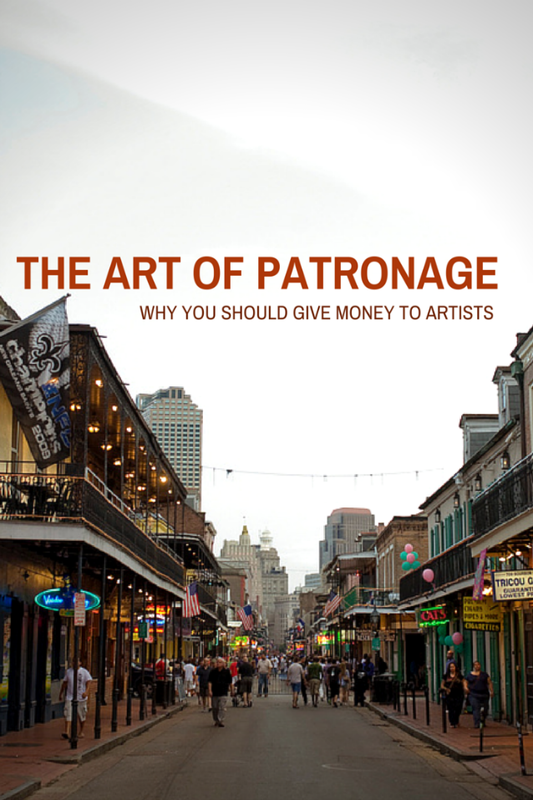 What about donating money to support your favorite artists? Do Writers Need Formal Training?